Is the UK Space's MoonLITE project still on? Impacting the Moon with ballistic projectiles to study its surface characteristics through debris plume sounds fantastic to me, especially with the success of previous such missions (or better said their ending) in mind, like for example impacting SELENE spacecraft on the lunar surface near the crater Gill, LCROSS observing Centaur upper stage (and data collecting Shepherding Spacecraft) striking the crater Cabeus, GRAIL Twins impacting between Philolaus and Mouchez, and so on. There are also planned impacts of other spacecraft, LADEE to name one. 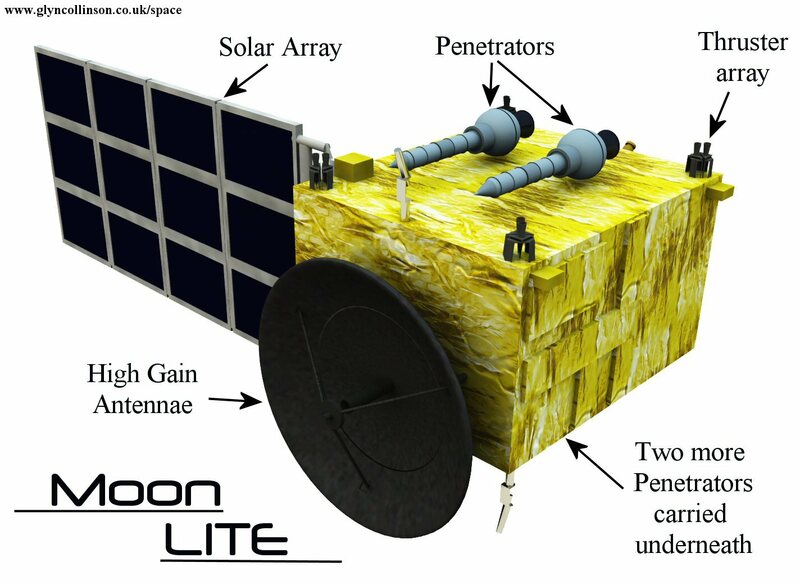 The Moon Lightweight Interior and Telecoms Experiment (MoonLITE), is a proposed British space mission to explore the Moon and develop techniques for future space exploration. If funded, it will be built by a consortium of UK industry likely including Surrey Satellite Technology Ltd, and it is planned to be launched into lunar orbit in 2014. The mission concept emerged out of a study run by the Particle Physics and Astronomy Research Council (now the Science and Technology Facilities Council) in 2006. In December 2008, the British National Space Centre (part of the UK Space Agency since April 2010) announced that the project was moving to Phase A study. This is a 12 month study of the mission system, the penetrators and the penetrator descent systems. No mention of what happened between 2009 when the mentioned study should finish and now, late 2013? What happened? The mentioned launch in 2014 should be around the corner. Didn't they fund it? With UK parliament recently bragging that the establishment of UK Space Agency has helped make UK's space sector a multi-billion pound success story, I would hope that they put some of those moneys aside for actual scientific missions, too. Render of MoonLITE spacecraft with four penetrators that would be deployed to near side, far side and both poles of the Moon. So, did they fund it and is the MoonLITE project still on? Has the 12 month long Phase A study from 2008 concluded favorably, giving the project a green light and it will indeed be carried out in 2014? What stage is the project in and when exactly will it be launched, onboard which rocket, from where and when can we expect any science done by it? The space penetrator has itself been in development for almost 10 years, and was originally proposed for a British lunar mission called Moonlite. That venture was eventually shelved, but the idea of a "hard lander" was so compelling, the European Space Agency decided to pick up the concept. There are a number of other articles online from July and August of last year. The L-DART concept is being developed by a UK consortium led by The Open Uni- versity (OU), with QinetiQ Limited, Airbus Defence and Space Limited and University College London, Mullard Space Science Laboratory. Not the answer you're looking for? Browse other questions tagged the-moon future-missions impact uk-space or ask your own question. Can a booster be designed to withstand 10,000 Gs? Was a nuclear device detonated over Earth's Moon? Has any space agency studied a lunar outpost architecture inside of a cave? What should a Discovery Program mission budget look like? What are the current state in plans to put a liquid telescope on the moon or in space? How feasible is the Moonspike mission? Where is the “almost certain” water in these spectra from Chandrayaan 1's Moon Mineralogy Mapper? How to communicate with a lunar polar mission?